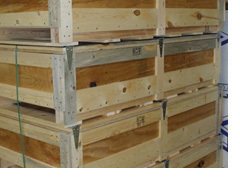 Wood Products Corporation produces pallets and crates for both domestic and international shipping. Our inventories of both hardwood and kiln dried softwood allow us to manufacture heavy duty crates made from hardwood that can be kiln dried after manufacturing. We also offer pre-heat treated softwood material for small quantities and rush orders. In addition to standard wood packaging items such as domestic 48x40's and wood shipping crates, we specialize in manufacturing custom designed wood shipping containers with CNC machined parts, foam padding, skid-mates and metal fasteners. We currently supply custom crates and pallets for electronic, medical, automotive, mining, forging, wind energy and power supply companies. Wood Products Corporation provides on-site packaging services. We can receive a customer's finished product at our facility, build a shipping package around it, load it into containers for export and provide documentation for international shipping. 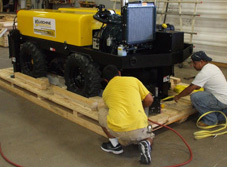 We also provide off-site services for crating oversized products for international export.